Last night I met my friends Sarah and Efrain at temple for our usual Tuesday night libations. 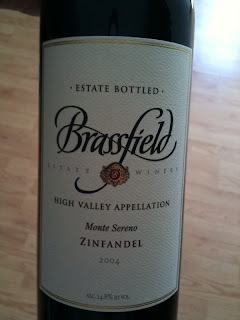 For fun I bought along a bottle of Brassfield Estate Zinfandel, Monte Sereno Vineyard. The High Valley region of Lake County was declared an American Viticultural Area (AVA) in 2005 and is home to some of the oldest Zinfandel vines in California. Brassfield has produced a great little Zin that contrary to the trend isn't super hot (14.8% alcohol) but rather very balanced. The nose is greeted by blackberries, cedar, and a touch of peppery mint. The wine is medium-full bodied with supple tannins and good acidity combining with the jammy fruit created a lingering finish that was a great experience.